Sigma 180mm/5.6 APO Macro, Review update. I wanted to do some updates about that lens since i now have more “in the field experience” with it. In short, i’m now using it more often than my Tamron 90mm/2.8 Macro lens, which was supposed to be my main Macro lens ! There is 2 main reasons for that: more working distance and better looking Bokeh ! The more i use that lens the more i like it, sure it’s not the toughest lens in town but it’s certainly better than a full plastic kit lens. The Sharpness and Bokeh quality surprised me considering the age and price of that lens. Apart from W/O at f/5.6, this lens is quite sharp, i consider it as sharp as my Tamron 90mm/2.8 Model 72E. One aspect that i was able to test in the field recently is the CA at f/5.6, i was shooting ice lately so i can now say that this lens is very well corrected, see the crop below. This shot was taken W/O at f/5.6, not the sharpest setting of the lens but the Bokeh is very clean and the highlights doesn’t show CA. As i said earlier, the Bokeh of this little Sigma is very pleasing, smooth and good looking. 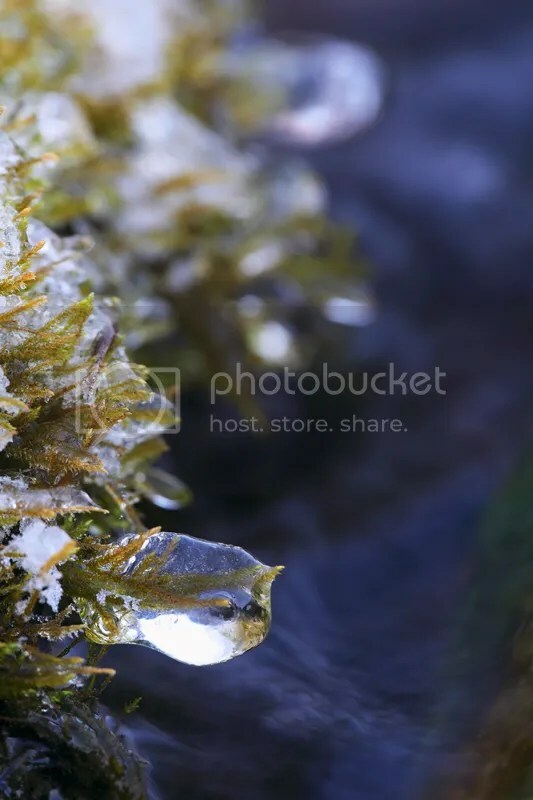 This photo of ice covered moss was taken at f/11, very nice looking Bokeh ! 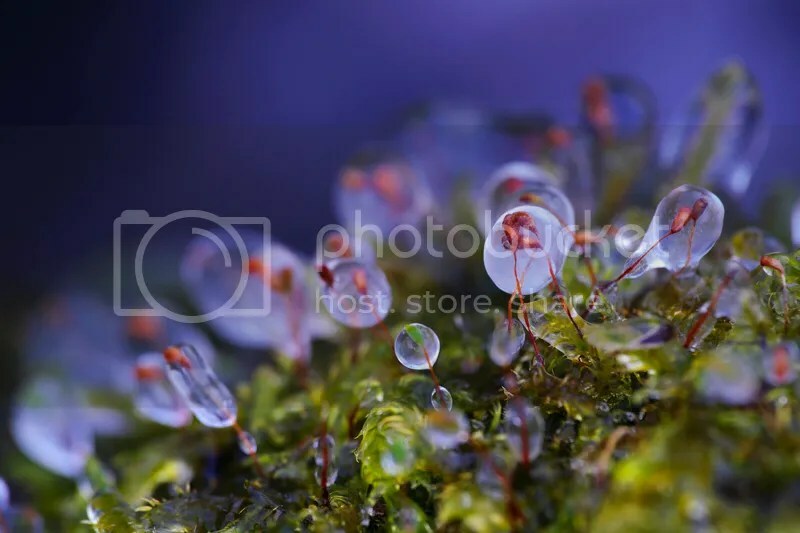 Another photo of ice covered moss, here i selected f/8, the Bokeh is still looking good and sharpness is very good. 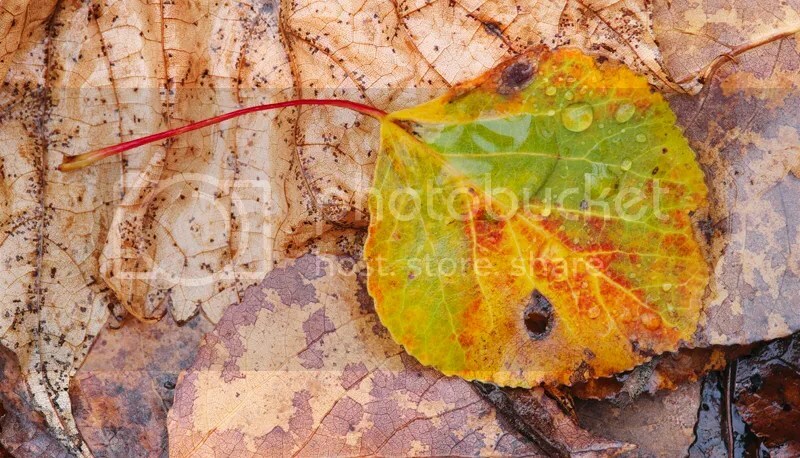 Here the lens was stopped down to f/13, very good details in the leaves. Here i did use a polarizer to cut off some of the reflections, again, i selected f/13. I still don’t like the aperture ring but i’m getting used to it …. sort of. The lens is doing well with my Fuji X-E1 (all the photos posted here were taken on my X-E1) because of it’s size and weight. I just bought an adapter to use the lens on my Canon 7D, i didn’t had the time to try them together but i’m sure they will work well even if the 7D don’t have focus peaking like the X-E1. That Sigma 180mm/5.6 Macro is now part of my regular kit and it’s always in my camera bag, it makes a very good combo with my X-E1 and produces great images ! This week it’s an adult Gray Tree Frog that was hiding in a tree at the day camp of my older girls. I found it just beside the entrance, i even removed some weeds in front of the Frog to have a better view. Taken with Fuji X-E1 and Vivitar 100mm/3.5 Macro, tripod. Now that i talked about the gear and how to use it, i will talk more about the artistic part and how to record and compose shots. The good thing about Macro/Close-up photography is that you can do it everywhere, you don’t need to live in a wild area, you can get some great shots even in your backyard. When i’m walking in the forest most of the time i’m looking on the ground to find an interesting subject. Once you found something interesting you will need to look for the best angle from which to photograph it, walk around (if possible) and get down on your knees if necessary. 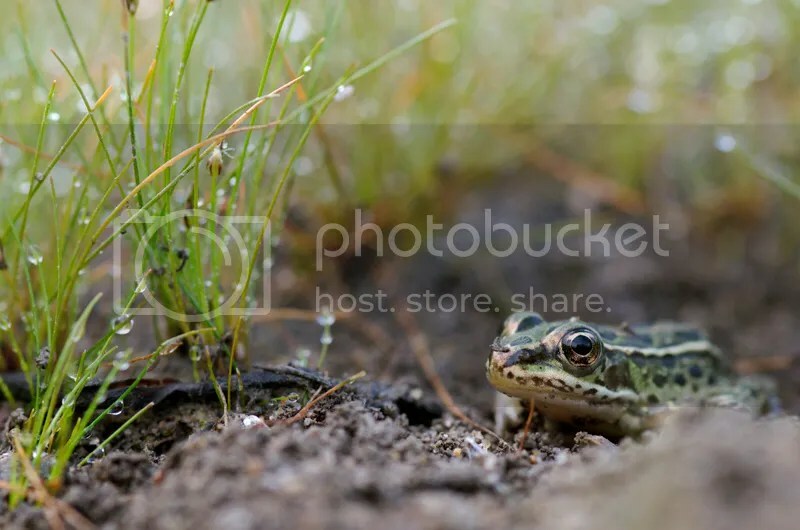 I like this photo of a young Leopard Frog that i took early one morning on the shore of a small pond because it shows the animal in it’s habitat. There is enough DOF on the frog but not too much that the background would become distracting, the Bokeh of the lens also helps here. The low point of view and the dew covered grass adds to appreciate that little fellow. Pentax K-01 with DFA 100mm Macro WR, ISO 1600, 1/60 sec. at f/5.6, handheld. 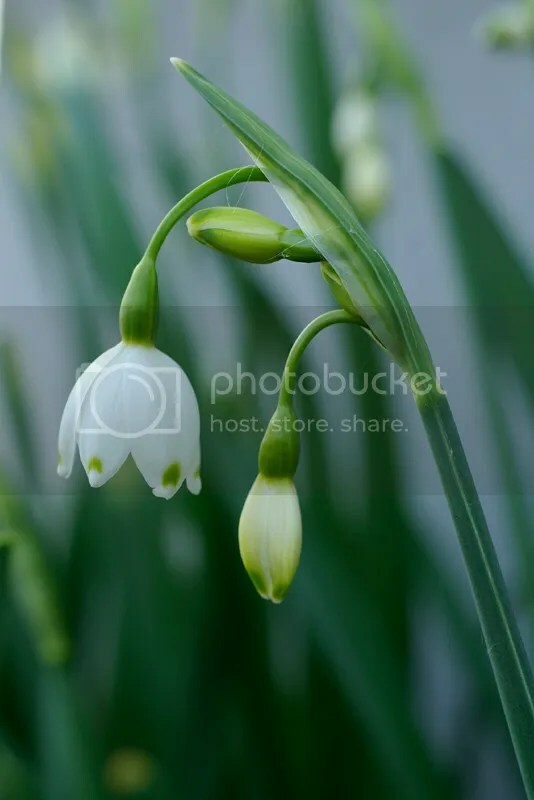 When shooting Macro photos you need to be aware of the background and always position your camera and also choosing the appropriate aperture to blurr the background so it will not distract the viewer from the main subject. You might need to move some weeds or branches in the background to have a cleaner composition. Color of the background can affect the final look of your shots and give different feelings when looking at the result. 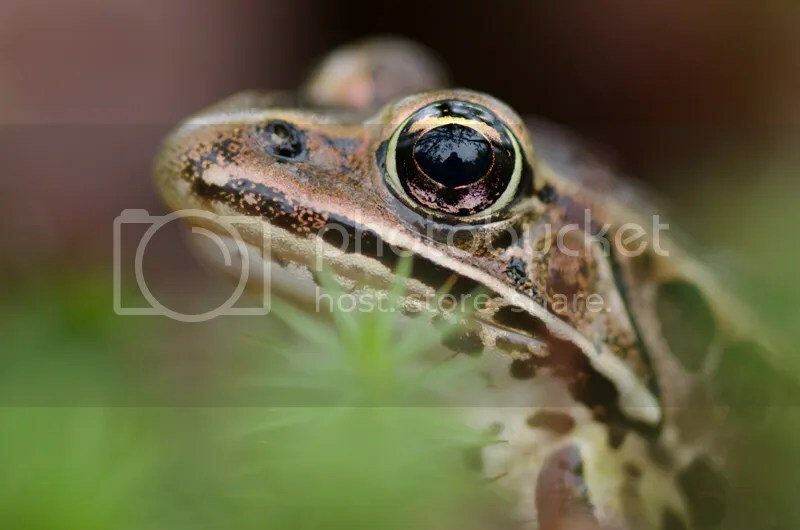 Sometimes the background can add to your subject especially if the subject is smaller in the frame and it’s part of the habitat (like the photo above of a Leopard Frog). 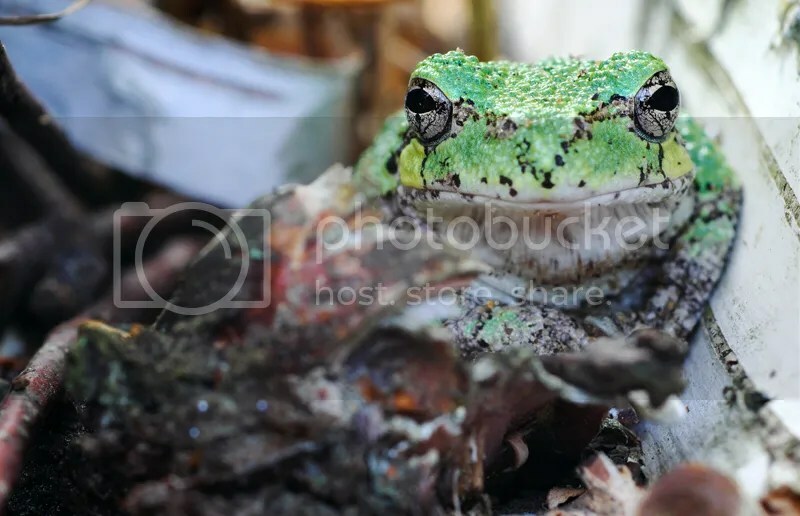 In this photo of a Leopard Frog i selected a wider aperture to blurr the surrounding of the frog and was shooting handheld at ground level but the lens was braced on a kind of bean bag. You might need to control the light hitting your subject, you can use a flash, but personally i prefer natural light (i don’t own any flash). I often use myself, camera bag or even took off my shirt to shade my subject from direct sunlight when necessary. If i need to fill-in some light i use my DSLR book (which is always in my bag) to do that or you can have a small reflector. 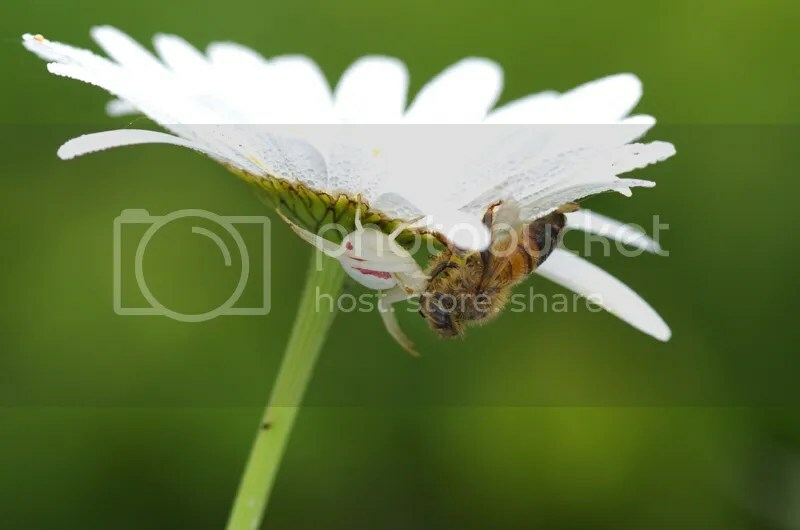 I was looking for photographing frogs at one of my favorite pond and saw this Crab spider with her prey on a flower. Since they were underneath the petals the light was not so good so i used my DSLR user guide to fill-in some light, even then the white petals were blown-out but i can live with that. So always keep your eyes open, you never know what you can find. Pentax K-01 with DFA 100mm Macro WR, tripod. Often the most difficult part is finding an interesting subject, taking time to look around, taking time to relax will open your mind and be more productive than walking too much in hope of finding a better place. Usually the longer i stay at the same place the best shots i get. 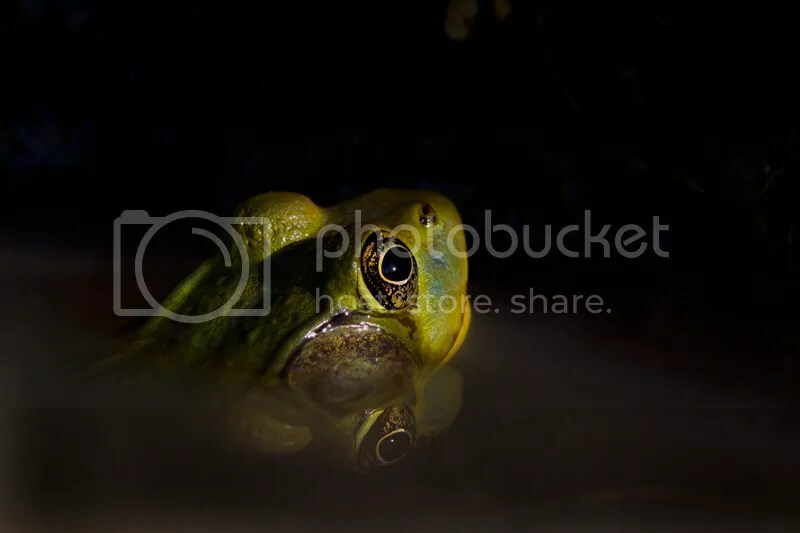 When i’m shooting frogs it’s the same thing, i try to find the frog that is in a better surrounding and let me get close enough to make a good photograph. After that i work around it and try different lenses if possible. 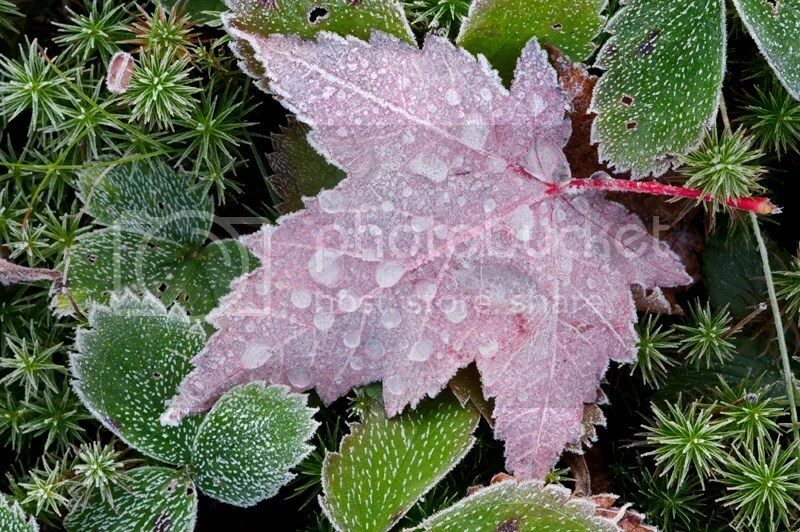 This was taken after a rainy day followed by a cold night, the water drops just frozed on the leaves. The difficult part was finding a subject with a beautiful surrounding. The technical part was easy, just stopped down the lens to have enough DOF to render everything in sharp focus. Sony NEX-3 with SMC Macro-Takumar 50mm/4, tripod. Don’t be afraid to experiment with shutter speed, DOF, lenses or even WB and ISO. Modern cameras give you a lot of choices and you’re only limited by your imagination. 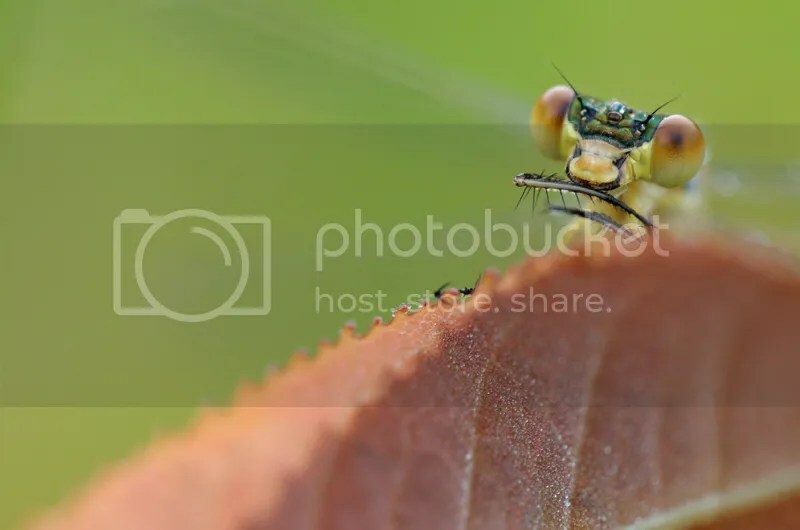 Don’t forget to bring your camera with you as often as you can since a Macro lens and a camera don’t take that much space and you never know when a small subject will cross your road. 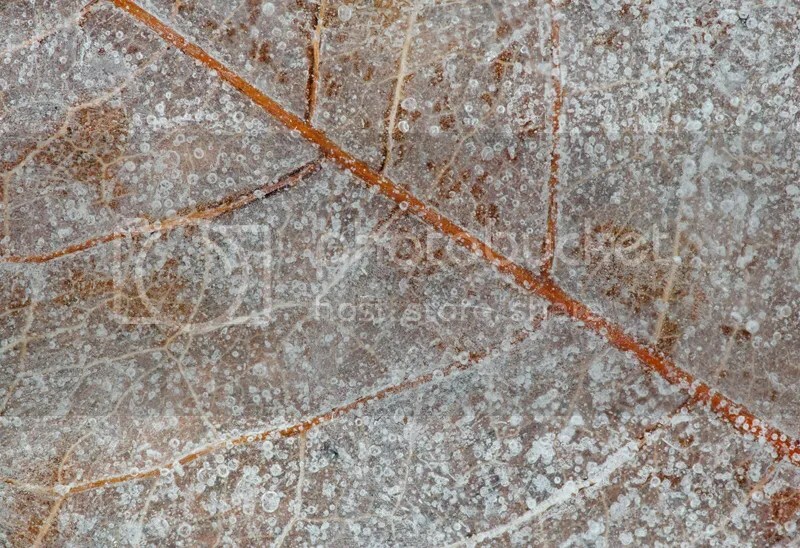 This photo of a leaf caught in ice is a good example of having a camera with me. 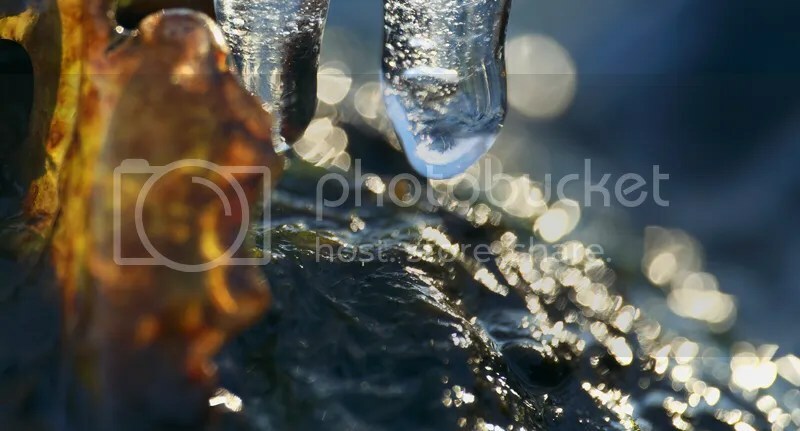 I took that photo on my way to work, i stopped on the shore of a lake and walked on the ice until i found the best subject. 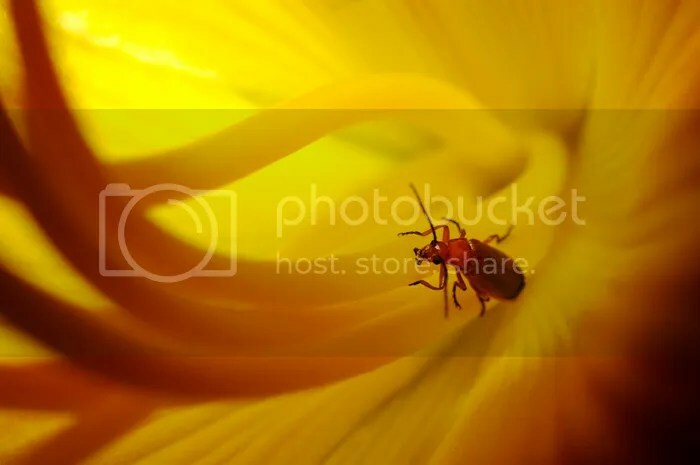 Macro and Close-up photography is a lot of fun and it can open a whole new world of opportunities for a photographer. You don’t necessarily need to buy a dedicated Macro lens, there is other options, we will look at that later. 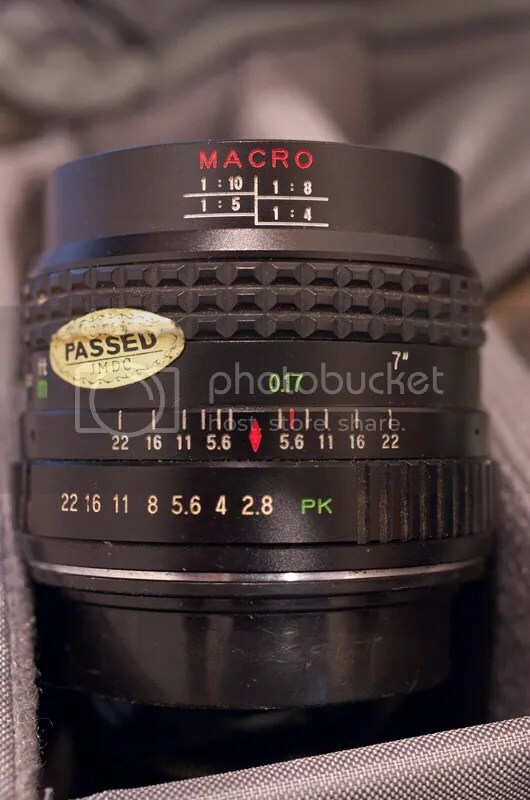 A true Macro lens can go to a reproduction ratio of 1:1 but some lenses (often older manual lenses) can be found that only goes to a 1:2 repro ratio and needs an extension tube to go to 1:1. Many zoom lenses have a Macro position but at best they will go down to a 1:3 ratio. Some wide angle lenses have a Macro position, i have an old Clubman 24mm/2.8 Macro that can go down to 1:4 repro ratio. Currently on the market you can find many Macro lenses in different focal lengths ranging from 35mm up to 200mm, some are stabilized and some rely on the image stabilisation in the cameras (IBIS). If you really want to get close with excellent IQ Canon makes the MP-E 65mm 1-5X which can go from 1:1 to 5:1 repro ratio. Macro lenses are the best way to go because they are easier to use in the field, you just turn the focusing ring as you get closer and the IQ is excellent, but they are not cheap unless you can buy old ones are some newer models on the used market. 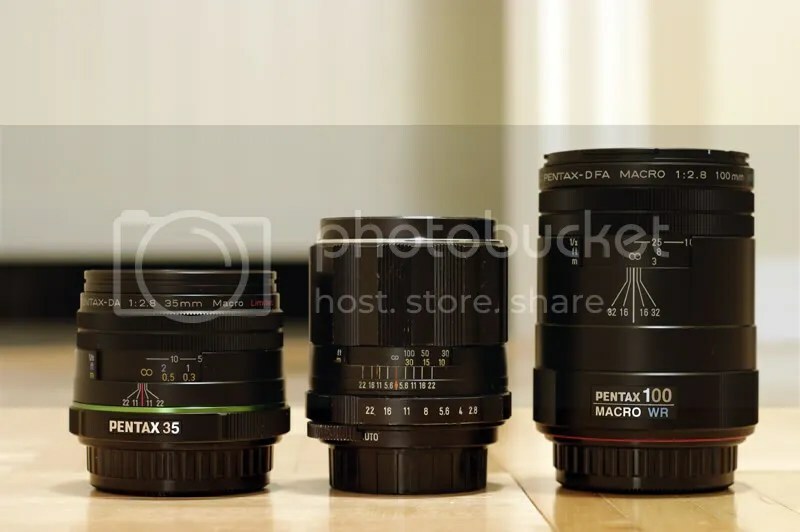 From left to right: Pentax DA 35mm/2.8 Macro Limited, SMC Macro-Takumar 50mm/4 and Pentax DFA 100mm/2.8 Macro WR. As a side note you can see the big difference here between the lenses from the old manual focus Takumar to the modern Macro lenses when you look at the distance scale, the focus throw of AF lenses is so short that those scale are pretty much useless compared to the old time. Here is my Clubman 24mm Macro, you can see the reproduction ratio on the front of the barrel. A small Macro lens like the Pentax DA 35mm Macro is easy to carry around and can give effect that a longer Macro lens can’t. Here i was so close that the lens was touching the flower and the result is that we feel like we are in the flower with the insect. 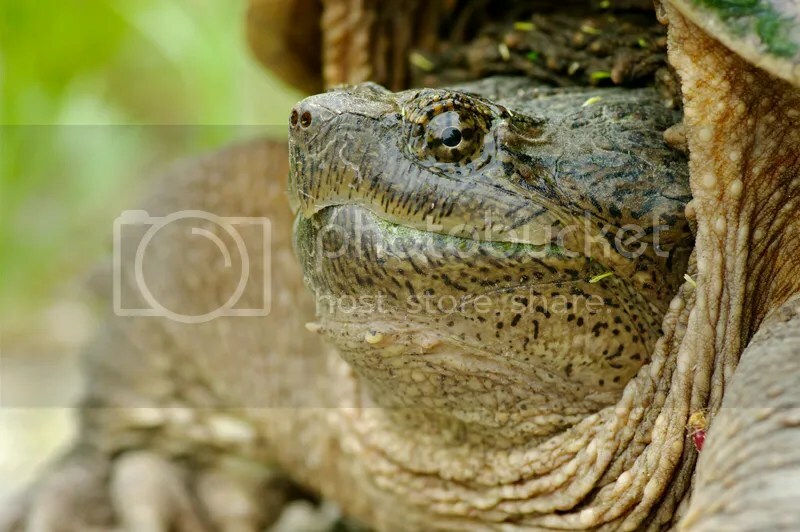 A longer Macro lens gives you more working distance which can be useful for insects or potentially dangerous animals like this snapping turtle. Here i was using my 100mm Macro lens handheld but a 200mm lens would have been even better to be safer. Here is a comparison between 2 Macro lenses to show how the focal length affect the background. The photo above was taken with the Pentax DA 35mm Macro Ltd.
Now, this one i tried to kept the same subject’s size with a Vivitar 90-180mm Flat Field at 180mm at the same f-stop. Also notice the different color cast of the 2 lenses. Reversing rings are a cheap way to get into Macro photography, you just screw the reversing ring into the filter thread of the lens and then mount it to the camera (BTW they came in different sizes, like filters). You need a lens with an aperture ring to do that if you want to control the aperture ring of the lens even if you don’t gain much DOF by doing so. The wider the lens the closer you can go and gain more magnification but you will be very close and the rear of the lens is exposed to the elements. You can’t vary magnification much by focusing the lens, so if you want a different magnification you need to use another lens. Another advantage is that you can mount whatever brand of lens you want. A reversing ring is a cheap way to get into Macro photography, you can use it on your kit lens or a small prime like a 28mm, 35mm or 50mm. 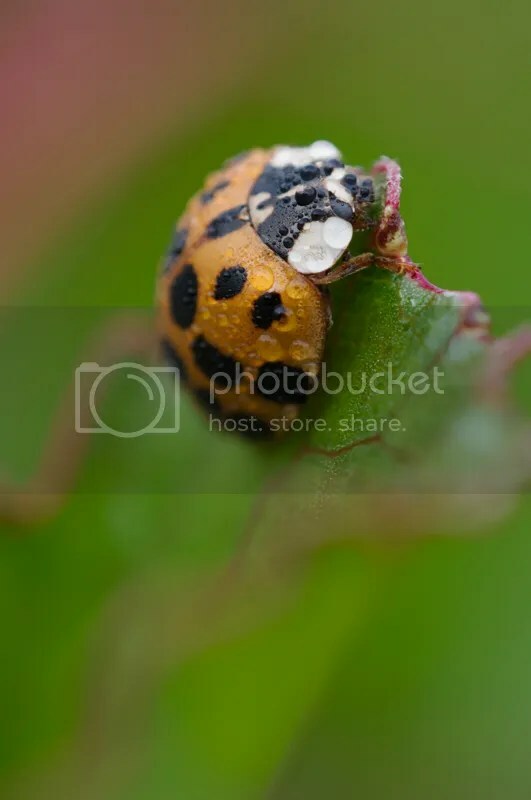 Here i used it with my SMC Takumar 35mm/3.5 to photograph this lady bug. Close-up lenses are like filters and when used on any lens they make it focus closer. They come in different strengths, size and quality. I have a Nikon close-up 6T, but Canon makes very good ones also, you will pay more for those 2 brands but the IQ is worth it. The advantage is that you don’t loose light when you use them but depending on the lens the IQ can suffer. You can still use them on a Macro lens for more magnification. Even if you have a Macro lens extension tubes are worth having in your camera bag, i use them with my Macro lens and also with my longer lenses to make them focus closer. There are many choices on the internet, you don’t need to pay for the ones from your camera brand since this is only tubes without any glass elements in them. They come in a set of tree but you can also buy them separately (Canon does that). I use Aputure extension tube set (13mm, 21mm and 31mm) for my Canon gear and they work very well with my lenses and AF works very well also even on my 400mm lens when needed. Extension tubes uses the same mount as your camera brand (if you use Pentax you need to buy K mount tubes, Canon EF mount for Canon ….) and you mount them between the camera and the lens. So if you want to use your 50mm/1.8 lens with extension tubes you need to add 50mm of extension tubes to get to a reproduction ratio of 1:1. 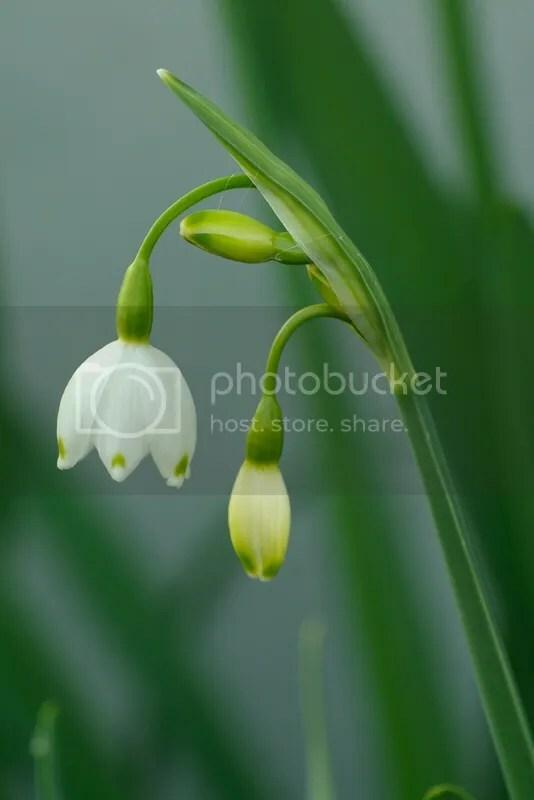 So here comes the biggest drawback of extension tubes,as you add extension tubes you loose more and more light and you quickly loose 1 or 2 stop of light which results in a longer exposure time. 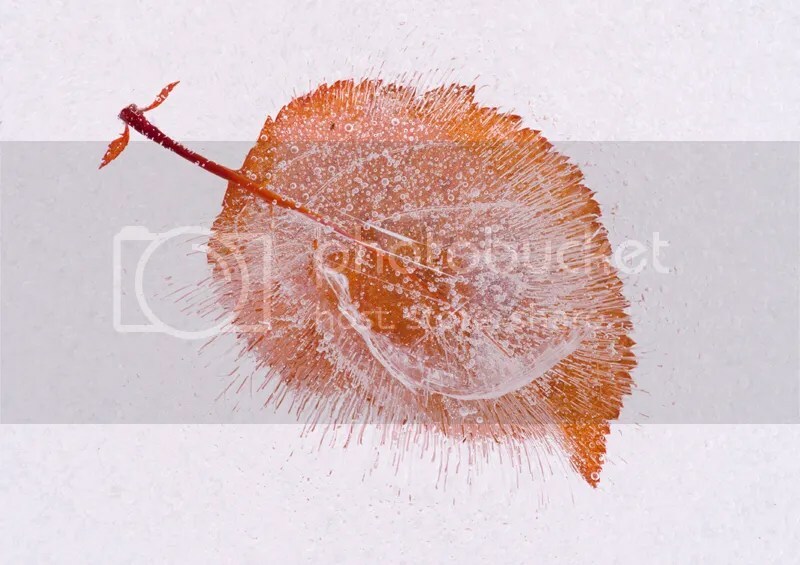 I like to use extension tubes with a zoom lens because the magnification varies as you zoom, so if you add about 50mm of extension tubes to a 70-200mm lens you will gain more magnification as you zoom from 200mm to 70mm. Here is a photo taken with a 70-300mm lens with 64mm of extension tubes, not in the Macro range but we can call it Close-up. Another photo taken with extension tubes added to a lens, this time it was to my Tele-Takumar 200mm/5.6. Yes they can be useful, i use my TC 1.4X with my 100mm Macro lens when i need more magnification but want to keep the same working distance and don’t want to disturb my subject. You can add a Teleconverter between your camera and the extension tubes to gain more magnification or to your lens alone. A good teleconverter is not cheap but the older Tamron 1.4X AF for my Pentax was working very well with my DFA 100mm Macro WR. The TC also cost you light, 1 stop for the 1.4X and 2 stops for a TC 2X. Sometimes a TC 1.4X is needed even with a 100mm Macro lens. There is also bellows that acts like a variable extension tube but they are not very practical to use in the field, too big and easy to damage. You can also reverse a 50mm on a 200mm lens but i’ve never tried it myself. I will post another article soon that will talk more on the use of the options above and techniques for using them. This week was not very productive for photography, so i just got some shots this morning. 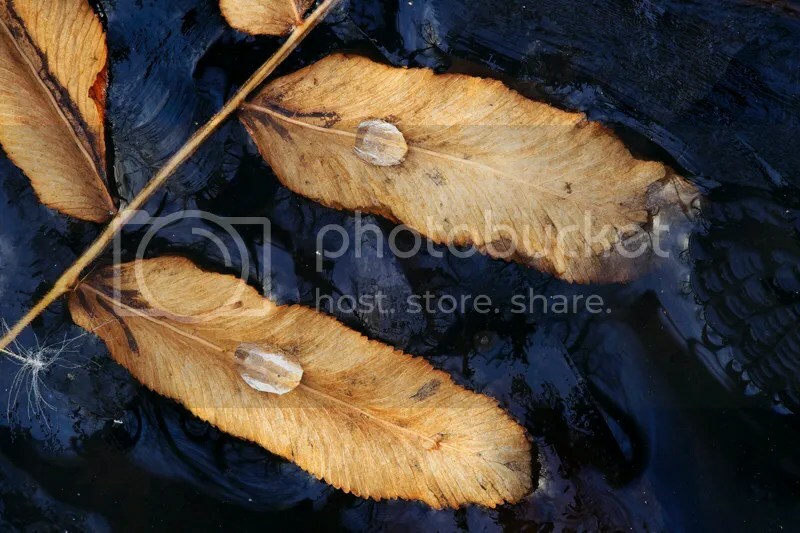 I’m sharing a Macro shot of a leaf frozen in a water hole. 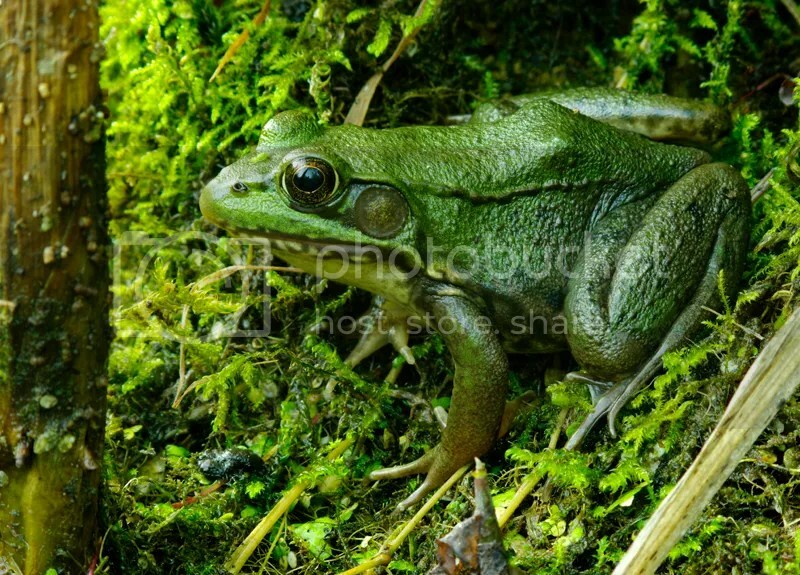 One of my photo in a Canadian Geographic article.